As anyone who has seen Mad Max: Fury Road will tell you - once they have picked their jaw up from the floor - the beating, scarred heart of the movie is one big-long car chase. George Miller loves cars. In the original Mad Max, and for a chunk of the first half of Road Warrior, titular character Max Rockatansky's police interceptor was based on a 1973 Ford Falcon XB GT. And when we say based, it was modded with anything that was found to be working in the post-apocalypse. In Fury Road, the cars are even more impressive. 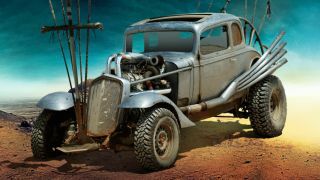 Speeding and crashing across the desert, there's a 1932 Chevy, complete with hot rod extensions, cars made entirely from spikes (called buzzards), a V8-powered beast aptly called the Powerboy and something named the Gigawall which comprises a pair of '59 Cadillac Devilles - it's the ultimate cut-and-shut job. "Everything in the movie had to have a very rigorous logic," said George Miller when we caught up with him at the Blu-ray launch of Mad Max: Fury Road. "The film is very helter skelter, this is a strong internal logic that underpins a film that is just chaotic and random"
This internal logic is the thread that sews all the randomness of the movie together - whatever you see on the screen should look like it could have been rebuilt by the person driving the thing. "Every design of the cars, the wardrobe, the weapons had to work to the same logic which is basically everything is repurposed, explained Miller. "So the cars that would survive an apocalypse are earlier technology. There are no microprocessors, no crumple technology, no airbags. They are robust cars." Tesla then, as much as it is the most futuristic car brand out at the moment, wouldn't survive a day in Mad Max territory and it's all because of pesky computers and petrol. "The big problem with something like a Tesla is the computers would let them down, they had no way to repair them. So we had to use simpler technology. And they had the gas from GasTown." Sorry, Tesla, we wouldn't expect a phone call from George Miller anytime soon. You'll just have to stick to your cameos in South Park for now. Mad Max: Fury Road is out on Blu-ray Monday 5 October. For more on the vehicles, check out the brilliant Mad Max vehicle showcase.